Artist and Author Susan Schwake recently visited to share her most recently released book Art Camp:52 Art Adventures for Kids to Explore. Before her visit, Susan invited me to choose an activity from her book to co-host with her in the Art Studio. From all the activities in her book that I thought our guests would love trying, I chose Shadow Puppets because I know our guests love not only to make things, but to play and tell stories with their creations, too. Since we didn’t already have a shadow puppet theater in the Art Studio, I decided to alter one of the puppet theaters we created for our marker cap finger puppets Special Sunday project. I also though we should make a couple theaters with everyday materials that might inspire our guests to make their own at home. 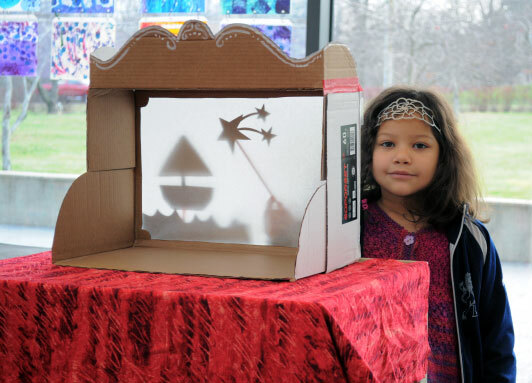 A quick search of DIY shadow puppet theaters on Pinterest brought up many easy-to-make examples using cereal boxes and shoe boxes. With shadow puppets on the mind I happened to pass The Carle’s cardboard recycling bin and spied a pristine copy paper box. I'm sure I don’t have to tell you that a copy paper box is a utilitarian treasure worth scooping up any day of the week. I knew THIS box was destined to become a shadow puppet theater. After a few minutes of studying my cardboard gold, I had an idea and got to right work without stopping to take a picture of the box first. Mark a line about ½ inch in from each edge on the bottom of the box. Use a box cutter or mat knife to cut carefully cut on the line to turn your box into a window. From here, you could skip right to step 6, if you to keep it really simple. Since copy paper boxes vary from brand to brand, the easiest way to explain the next step is to say: “make it look like this.” Here’s a stab at a written instruction: Use the seams already present on the box as a guide to make a flap on each short side as pictured below. Then, lay the box on its side and open up the flaps. Score across the long side of the cardboard so that it can unfold as pictured below. Create a fancy symmetrical design for the top of your theater. To do this, I folded a long piece of paper in half, cut a swooping line, opened the paper again, clipped the paper to the box, trace the design to the cardboard then cut on the line with scissors. Alternatively, you could just draw it right on the cardboard and then cut it out. I added some curlicues with a thick white paint pen after. Tape the side flaps from the decorative top edge back to the side edges of the box. Tape a piece of thin white drawing paper to the back of the box, overlapping the hole you cut. Light the box from the back and you’re ready for a show! For Susan’s visit we put out black construction paper, straws, tape and scissors for making shadow puppets. Guests of a wide range of ages had fun going back and forth between the puppet theaters and work table, making adjustments to their puppets once they could try them out. Our work study student, Claire, made a cereal box theater and modified one of our existing homemade puppet theaters by adding a thin paper screen and some cardboard supports to keep it from tipping over. We also set up our light projector on a low table to use with the puppets which was a hit with our youngest guests. The copy paper box theater worked the best because it was the perfect size for the puppets created and didn’t tip over if a puppeteer bumped it. Have you ever made a shadow puppet theater at home your in your class? What materials did you use? Thanks for stopping by and happy puppet making! This entry was posted on Tuesday, December 22nd, 2015 at 3:00 pm and is filed under By Meghan Burch, Elementary School, Found Materials, Light, Paper, Special Guests and Artist Visits. You can follow any responses to this entry through the RSS 2.0 feed. You can leave a response, or trackback from your own site.